Home > 2014 > 07/29 > Where does Luke Gazdic fit in? This summer, Edmonton Oilers general manager Craig MacTavish unveiled an ambitious plan for next season’s team: three scoring lines and a defensive zone specialty unit. He then signed Luke Gazdic to a two-year extension. Even Gazdic’s most grudging critics will generally admit that he fills the fighting part of an enforcer’s role to a tee – he fights everyone, he wins far more often than he loses, and he looks good doing it. The other thing about Gazdic is that he’s a pretty good skater, something that doesn’t always come with the territory. The combination of big and scary and fast is one that many people love – it’s what made Ben Eager a first round pick, and it’s why Jean-Francois Jacques (60GP, one goal, one point at the time) started 2009-10 lining up with Ales Hemsky and Shawn Horcoff. But, as the examples of Jacques and Eager show, big and fast isn’t always enough. Like Eager, Gazdic occasionally struggles to put his tools together, and his positional play can be erratic. Even more so than Jacques, Gazdic struggles in the ‘take and make a pass’ department – he isn’t good with the puck at either end of the rink. Under the old model, it didn’t matter. Gazdic was an “energy line” player, which is code for a unit that’s expected to go out and kill five minutes hitting the depth on the other team, without any expectation of scoring and without much in the way of defensive responsibility. Under the new model, where does a player who lacks the offensive chops to play on a scoring line and lacks the defensive head to play on a tough minutes unit go? MacTavish referenced Chicago when he talked about his new-look Oilers, and one of the interesting things about the Blackhawks is their employment of Brandon Bollig. Like Gazdic, Bollig is big (6’2”, 223 pounds) and scary. Also like Gazdic, Bollig is not blessed with an overabundance of natural skill. He posted four points in 55 AHL games at age 23; Gazdic had 11 in 59. Gazdic posted four points in 67 NHL games at age 24, while at age 25 Bollig was 0-for-43 major league contests. Last year Bollig played all 82 games for the ‘Hawks, averaged more than 10 minutes per contest, and posted a respectable 50.9 percent Corsi rating coupled with an 18.3 percent zone start. Those are numbers analytics types drool over. For good measure, Bollig also had 14 points, but the big item here is that he was a regular member of a fantastically successful defensive zone specialty unit. How did they make it work? I was curious, so I went back and watched Bollig’s play in Game 1 between the Blackhawks and the Blues in this spring’s playoffs. It was a triple-overtime affair, and Bollig hit a season-high with 15:30 in total ice time, with the latter reason being why I picked it. Off won draw to the left of the goalie: Bollig would charge from his starting position in front of the net and out to the left point. Chicago’s usual play was to overwhelm the right side and get out of the zone with possession over there, but if that proved impractical they would typically rim the puck around the board to Bollig, whose sole job was to chip the puck out of the zone. Off won draw to the right of the goalie: This is basically the same play, except that instead of charging at full speed to the left point he moved there more slowly. Again, Chicago generally tried to get the puck out the right side of the ice, but with more Blues already over there they made the play to the left more often and again Bollig’s sole job was to chip the puck out as it went by him. Off lost draw to the left of the goalie: Bollig would charge at full speed from his starting position in front of the net and directly at the opponent who got the puck off the draw. He booked it, too; there was a false start on one of these and he was at the top of the faceoff circle before he caught himself. Off lost draw to the right of the goalie: This seemed to vary based on how quickly the Blues’ left point man moved over. If he moved over quickly, Bollig would wander out in that direction to provide coverage; if he didn’t Bollig would follow Marcus Kruger at top speed to the place the puck was won to. The big caveat here is that this was only a single game (well, practically two but I digress), but even so the results are suggestive. Bollig succeeded on Chicago’s defensive line because his role was tightly defined and he wasn’t asked to do anything he wasn’t good at. Every big, physical winger is charged with getting in on the forecheck and banging bodies; these set faceoff plays are basically the same thing except with the player charging the point instead of the far boards. As for the breakouts, Chicago preferred a right side exit and possession but they used a left side chip-out often enough to force the opposition to defend both and the beauty of the left side exit is that it didn’t require Bollig to do very much with the puck; all he had to do was take a whack at it. Niklas Hjalmarsson (4) will be tasked with getting the puck while Johnny Oduya (27) gives him a passing option. The centre for this play (Ben Smith, 28) will physically battle his opposite following the draw and then shift over to the front of the net in a defensive role. The two wingers (Marcus Kruger, 16 and Brandon Bollig, 52) will move to their respective points, with both eventually falling back to support the play. Here’s where trouble starts. 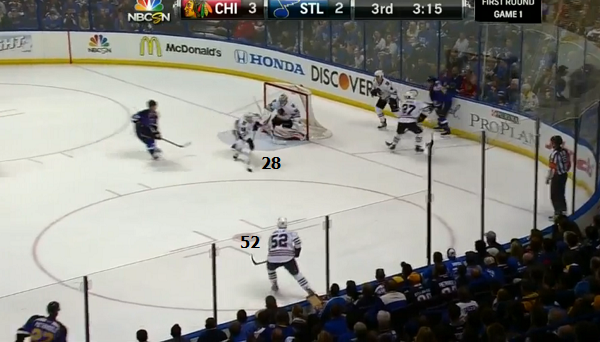 Smith now has the puck in front of the net, but he has pressure behind him and only one obvious passing option: Bollig. 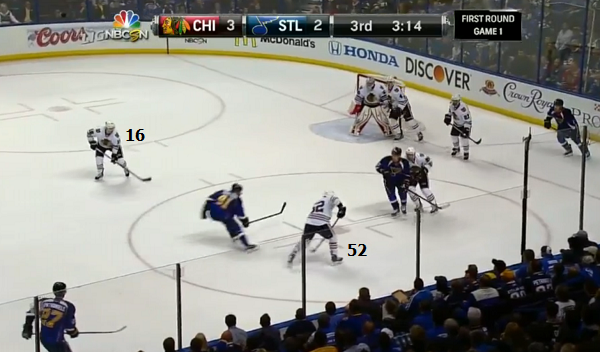 Bollig has time and space, but as we’ve mentioned he isn’t a gifted player with the puck. The Blues’ Magnus Paajarvi Vladimir Tarasenko (Paajarvi switched to 56 because Tarasenko already had 91; I’m just too used to seeing “91” and thinking “Paajarvi”) gets to Bollig as fast as he can. Bollig can’t make the quick play under pressure and ends up sort of bobbling the puck; by the time he has it back under control the obvious pass to Kruger is too dangerous. Instead, he spins and tries to lob it out of the zone, putting it right on the stick of Alex Pietrangelo on the point. St. Louis gets a dangerous shot off the play. Still, most draws didn’t end up this way, with the puck more or less forced out the left side of the ice and with Bollig given the responsibility of making a play with it from deep in his own zone. For the most part, Chicago made use of his skills and the line enjoyed considerable success. Are they better off without Bollig in the role? Stan Bowman seems to think so; he dealt Bollig to Calgary in exchange for a fourth third round pick at this year’s draft. From a hockey standpoint, he’s probably right; adding someone a little more adept at making plays with the puck is going to help in situations like the one sketched out above. He’s seemingly decided that upgrade is worth the risk of going without an enforcer, and for what it’s worth I think it’s a sensible decision. Sensible or not, it isn’t a decision Edmonton is ready to make, which is why we’re asking where Gazdic fits in. I think Gazdic fits in pretty much exactly where Bollig did last year – as a winger on the defensive zone line (at least in some games), charged with attacking the point quickly and chipping the puck out of the zone when the Oilers can’t make a breakout with possession up the other side of the ice. Correction: I neglected to double-check my memory against fact, and I’ve been thinking of Boyd Gordon as a left-handed shot, when of course he’s actually a right-handed shot. This puts the Oilers in a situation where they have both a good left-shooting faceoff man (Matt Hendricks) and a good right-shooting faceoff man (Gordon) and thus are in excellent shape to take a draw at either side of the ice in the defensive zone. Bollig was had for a third round pick actually. Thanks, Kent. Nicely done, Stan. Not so nicely done, Brad. All the best to the Calgary Flames in this coming season. All the best? Come on, this is the flames we’re talking about. Only reason we need Gazdic in the first place is because the entire flames forwards corps, outside their rookies, like to fight…see Tortorella craziness for references. I think you may have misunderstood Willis when he said “All the best …”, to our slow-witted friends from the south, because his tongue was planted so firmly in his cheek. Usually I can figure out why a comment is being trashed, but in this case a factual correction from the excellent Kent Wilson of Flames… oh, nevermind, I see it now. Isn’t there an unspoken rule that every roster needs hair? Gazdic fills that need admirably. He pissed off Don Cherry and told Yak he will show him a few tricks when he drops his gloves. Nothing that will win you games but I like him none-the-less. Solid character, poor roster utilization in the great scheme of things unfortunately. This is why I don’t like the three scoring line and one checking line model. If we try to play without a tough guy again we risk our young players getting pushed around. We go back to the days when Shane Churla would run us out of the rink. Aside from Aulie, Hendricks, Perron, Pouliot and Ference we still have a pretty soft team. Guys like Hall and Eberle are nowhere to be found in a scrum. I think we still need Gazdic in the lineup. I think he’s a liability on the checking line…and if you play him on the soft offensive line you are really handcuffing Yak and Leon or whoever is there. Chicago made Bollig work on a checking line. I’d rather a team aim for four lines that contribute – even if it causes problems at times – than just write off its fourth line as physical and nothing else. It appears to be the direction we are going so I hope we can make it work. I think a lot will depend on Gazdic and how much he can improve. Hopefully it works out. Throw him in when other players aren’t producing or when we’re on a losing skid and they need someone to spark the crowd. The oilers are not “team” tough enough to do without Gadziac. He’s a great guy, leader and the only one on patrol to keep other teams respecting our younglings. Until we have the mentality that the whole line swarms an opposing player for disrespecting one of our own, and truly sticks up for each other, his role is absolutely vital. My only knock on Gadziac is that Kassian never paid a price for what he did… The stick was one thing but the subsequent mocking deserved to be addressed. I am not sure if there is any truth to it, but I had heard the league informed both GM’s that there would be no retaliation. Actually, Gazdic spoke about that. He did challenge Kassian, but Kassian would not fight. His alternative would have been to go all Shawn Thornton, or Bertuzzi him, and that would not have been accepted by the league nor the team. I think that if our so called #2 and #3 lines will have nice pairing combinations. This will allow for Gazdic to fill in a spot for the odd shift or two during the game, espcecially if these other teams start taking it to us physically. There’s always some of this. Bollig played more than 75 percent of his minutes with Kruger, but got a little over half an hour of spot duty with Patrick Kane over the course of the season. Oh, for the love of Pete. Of course he does. I don’t know what I was thinking. Very nice article, though! I’d been wondering what could be done with Gazdic given the new ideal of having 3 scoring lines and a defensive line. This is a good look at what can be done to coach the liabilities out of an asset. Regarding the Dzone mules, do you not have Gordon as the C? If they go with Gordon (RH Center) and Hendricks (LH center occasionally) their problems with draws are fine. 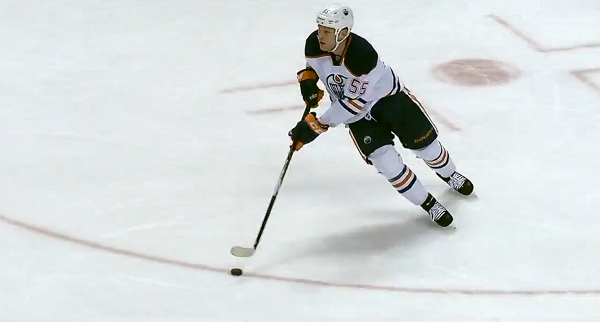 Hendricks was not used in the middle in Edmonton, but is a good face off guy. I’d prefer Pitlick or Lander on the right side, but Hendricks can play over there if Gazdic is necessary to beat up some Flame or Canuck. Otherwise he should have a lot of pressbox. Is there any reason why you can’t dress 13 forwards, 6 defencemen and two goalies? If not then I think Gazdic has a few things going for him. First, as you pointed out he’s quick enough to actually play in the NHL, so keeping up to guys like Gordon and Hendricks shouldn’t be a problem. 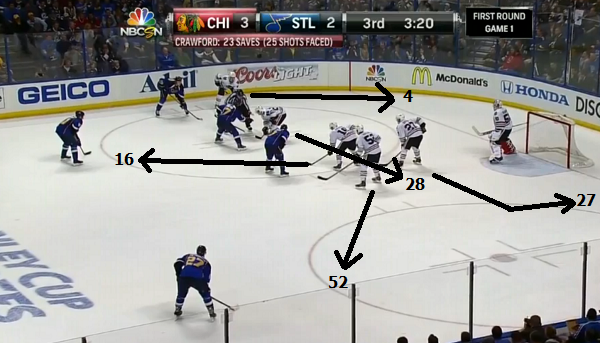 Second, learning the Bollig role doesn’t appear to be that complicated. By my eye, Gazdic was not as chaotic as a lot of fourth line guys, and could easily develop into a fighter that can forecheck, and chip in the odd offence. I remember Stortini got 9 goals on the fourth line one year, is that too much to ask for Gazdic playing on a tough minutes shut down line? Yes. Third, that line is going to see some difficult competition, meaning he has the chance to grind and cream some top talent, if he can be competent at his job. Fourth, Edmonton has two players who play their role maybe the best in the league: Hall who can make a case as best LW, and Gazdic who can make a case as best enforcer. So I see him fitting in when Edmonton plays Calgary for sure. And if he can develop a bit and learn an easy style role, then I say he’s earned a chance. Maybe he could learn a Laroque style puck possession whereby he can cycle and maintain puck possession along the boards. Yes. NHL teams are limited to a maximum of 18 skaters and two goalies. I don’t know Willis, you were wrong about Bollig third round pick, and you were wrong about which way Gordon shoots. You sure you checked your facts on this? On another note, on the nights Gazdic is not dressed, given the minutes this line will eat and the fact that UFA’s like Winnik, Booth, and Downie are already gone, do you see Lander, Pitlick, or Pinnizzoto as the best internal option for that RW spot. I could see them taking a look at Lander, which would give them the option to move Poulliot to that spot, and Lander up to take the “soft minute” third line draws to help out Draisaitl. Or some combination of that. Point being it gives Eakins some in game options that he would not have with Gazdic, Pitlick, or Pinnizzoto. I actually did check my facts on Bollig – I guess “4rd round selection” should have been a giveaway. And yes, if you wander over to the NHL rulebook it actually says 18 skaters and two goalies. Just winding you up a bit. I am assuming, because it’s in your article, you are bully on Pitlick then? I agree and am looking forward to seeing him play 4 games before he gets injured. So after that happens, my guess is Lander. I think this will be good for development on the farm as well. Down there you have Miller as an AHL vet, and then behind him you’d have Yakimov and Jujhar fighting it out for ice time, essentially battling for first call up to the 3rd line, or for the 3rd line centre position next year. Nuge, Draisaitl, Yakimov, Gordon is going to look good. Lines 2 and 3 will finally have both size and skill, and the Oilers will at last be a ‘tough team to play against’. After all, after the Nuge line, who the hell do you send out to defend against Perron, Draisaitl, and Purcell. Then if you figure that out, who do you have left for Poulliot, Yakimov, Yakipov? Nah, I’m not big on Pitlick. I think he’s probably the best option the team has, and he has the physical tools, but he’s always injured and unless that stops he’s not going to have a career. This is a needless debate. 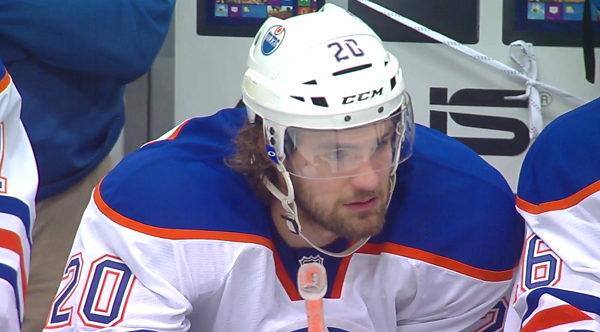 We have seen the Oilers with and without Gazdic already. Without we saw Gags teeth caved in and people taking runs at Hall (all in pre-season). With Gazdic we saw this behaviour stop. I don’t think of myself as one of those old school guys that think fighting is important in todays NHL but you have to have guys who can keep the Kassians and Cookes in check. Until the Oilers have a Duncan Keith or a Jarome Iginla in its core they should keep Gazdic as their 13th forward. Team toughness is much better than having a dedicated enforcer but having nothing at all can have catastrophic consequences as we saw lat pre-season. It arguably was a contributing factor for the Oilers not playing meaningful games by November. JW: Your memory is short. Last pre-season MacT was in a panic. It appeared at the time like we could lose one of our star forwards each game we didn’t have an answer to the other teams shenanigans. This is why he rushed out to sign Macintyre and then Gazdic immediately after. Was it a small sample size? Perhaps, but maximum remorse is much higher having one of our young stars lose a season due to careless and questionable hits. Nuge, Hall, Draisaitl, Ebbs, Yak, Schultz, Marincin, Klefbom. It doesn’t have to be Gazdic but he has clearly earned the respect of this group and the coach appears to trust his judgement. A roster spot is worth giving up to help keep these guys healthy. No, my memory is just fine. MacT may have been in a panic, but that doesn’t mean Gazdic and MacIntyre work to prevent injuries. And I’d also suggest Hall doesn’t have a problem standing up for himself. There are smart people who agree with me that fighting isn’t an effective deterrent; there are also smart people who disagree with me on the subject. That’s why I wrote this piece the way I did – I’m on one side, but there’s room for disagreement among reasonable people. Heck, we heard Dallas Eakins trying to balance both sides this season, unsure which was right. Did you see the game when Scrivens stepped out of his net to take matters in his own hands after someone took a run at RNH? I tend to feel this shouldn’t be in his list of duties. I’m curious how you see that situation (if you remember it). All Oiler fans will be happy Gazdic is in the line up when we play teams like Calgary who just signed English and a few other goons. Gazdic will keep everything nice and quiet out on the ice. I think a prudent course of action for Mr. Gazdic would be to play him primarily in games where his particular skillset would be most advantageous – maybe 30 – 35 games a year. In those games I would spot his shifts based on circumstance. In the cases where the coach is unhappy with matchup in front of him, he could presumably spot in Hall, Perron or Pouliot as your “checking line” left winger, all of whom would be more than capable for occasional double shifting with Gordon and Hendricks. Any of these guys has the ability to add a different dynamic to the “4th line” without overplaying a single guy. Having said that, I like Gazdic and hope he continues to work on his skills and can play a regular shift in the league down the road. Like most tough guys, Gazdic appears to be a great teammate. By the way…Peter Mueller signed with the Blues. And for 700k per for 2 years. Wow, what a bargain. I wonder if Edmonton even tried taking a run at him. He would have been a great addition. i’ve been saying there is a need for enforcers in the game to protect but the way the league has been going, all that happens is someone takes a run at a ‘skill’ player, than gazdic goes out and fights someone not involved in the original play and they sit for 5 on a different bench. the only fights are typically the 2 face punchers on each team and then play starts again. i don’t know how important the role of the enforcer is in todays game. our issue is you have to be team tough, and our guys have never had to fight for themselves before, someone would always stand up for them. i think it’s time for everyone to man up and battle. play with speed and skill with no back down, it’s only a punch in the face, it happens all the time. Very slowly, the Oilers are addressing this. Perron, though not really a fighter, is always in everyone’s face. Purcell, Pouliot, Fayne, Nikitin, and Aulie, are all additions that have size. Making the team as a whole a lot tougher to push around when it was Gagner, Hemsky, Nick Schultz, and Belov. Then coming up there’s Nurse who is a mean player, and then guys like Moroz, and Jujhar. I am curious to see how Draisaitl will handle himself. And I do remember Arco not one for taking crap. Handricks, who was a late edition last year, was also a hit parade. Add in Pitlick and the team has a completely different make up. Finally if all speculation is true, and I’m not sure that it is, Petry could be traded for either another defenceman (fingers crossed on Boychuck), or another centre. Is there a stat that properly calculates the value of deterrence? No there is not therefore writers like you struggle with players like Gazdic. I for one could care less if he can take or give a pass……..if he can skate, hit, and ocasionally fight, that’s good enough for me. He will develop his skills over time and if he can just add shooting to his bag of skills, this guy has a legitimate role to play long term. Yeah, stupid stats geeks, not properly valuing deterrence. A little sensitive are we………I don’t recall calling you stupid? As for deterrence just how does one put a value on it? I suspect asking the smaller skilled players would enlighten ALL of us……..Gretzky put it best, and that’s good enough for me! Oilers won’t have to make room for him on the roster. He’ll rip up his shoulder again and be done for the year again. You can’t surgically compensate for the abuse a fighters shoulder absorbs over a season. Luc is done for the year before he gets 10 games in his season. One should ask, who’s going to replace all that offense…. If theres anyone who knows about fighting its QSB. Tell us some more glory days stories, please, PLEASE!! Gazdic is one of the biggest beauties on the Oilers and has been embraced by the “skilled” element as their neanderthal bro. This has room value and team concept value but I can see why people would struggle with it from a hockey player in a statistical framework kind of sense ….. as on that level big Luke bleeds to the wrong side of the mean. I wish Kassian had manned up and squared off with the big lug…. that would have been a gooder. I like Gazdic and the toughness he brings. If he plays regular 4L min with Gordon and Hendricks I see him chipping in 10-20 points. All while smashing in guys faces. First, even if Gazdic or one of the other goons was on the team when Kassian chopped Gagner, he would not have been on his same line and could only beg for a fight after the fact. Second, how does suiting up a goon deter sloppy stick work from the other team? Ever see a player pull his stick away in mid chop? Gazdic can be useful if he brings up his skating and puck handling skills to at least be an 8-10 minute option each game. Otherwise, sign a MMA fighter to ride the pine because he would be the same level of deterrence as Gazdic. I like having one of the toughest guys in the league on the team. Gazdic seeing limited duty sounds good to me. Give him some strategic minutes when playing some of the tougher teams. Against all the rest he sits in the pressbox. Where Gadzic fits in is dependant on his improvement over the off season and by his own admission he needed to improve his puck handling skills. He needs and wants to be more than a pair of fists so I say let him determine where and how much he plays by how he plays. I know the guys play with more confidence when he is on the bench. 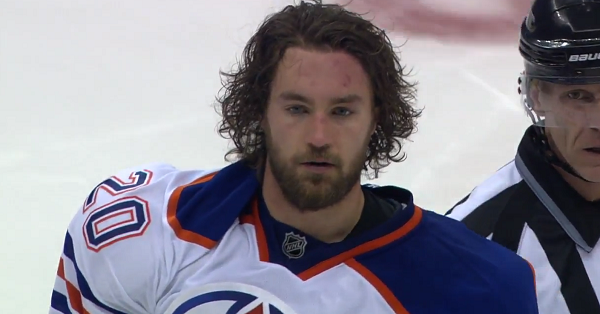 Gazdic is a tough young kid, and one of the top fighters in the NHL today. Hockeyfights asked Brian McGrattan, as the NHL’s top dog, for his list of the top-5 fighters in hockey. McGrattan listed Luke Gazdic at number TWO. To be the big dog you have to know the other fighters EXTREMELY well, and the best in the world at his craft consider Gazdic to be among the best in the world. Edit – something something hockey ability something something. I thought when I clicked on the link, I was going to read a one-word article. Bravo for giving this guy the benefit of the doubt. With or without his visor? Ill take Gazdic any day over Lander. Gazdic at least brings speed, size and toughness. Lander is slow, small and contributes little to no offence at the NHL level.